1. Please introduce yourself: name, organization, field of work and country. 2. According to your knowledge and experience, is gender diversity at executive committee level a competitive advantage for firms? 3. 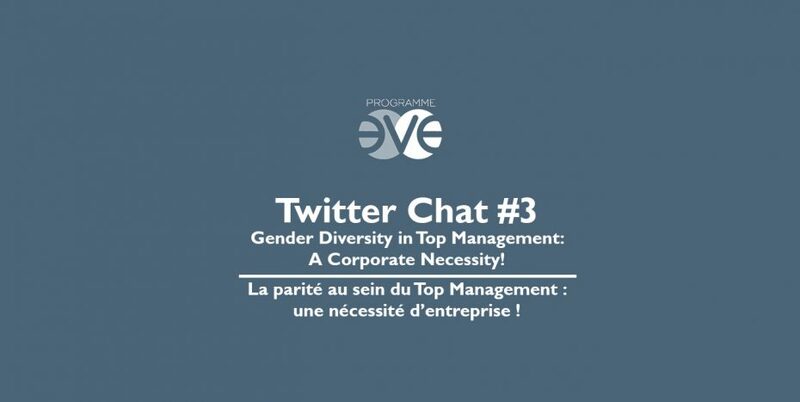 How can companies leverage gender diversity to drive innovation and performance? 4. Why does gender diversity at the top remain a challenge, and what are the effective measures to tackle it? 5. What is the role of regulatory action or governmental support for promoting diversity in management? A lot of key informations, tips and opinions have been shared on this issue. We made a Storify** to summing up all the tweets so you can capitalise on the inputs of this Twitter Chat. We hope that you’ll join us for our next Twitter Chat in March on the occasion of the International Women’s Day . *A Twitter Chat is a scheduled event that allows participants to engage on a topic using a designated hashtag on Twitter. A host/moderator guides the conversation (EVE Programme) and featured guests answer the questions (you!). Followers can participate by submitting questions or responding to our guests. **A Storify is a social digital tool that allows you to look back on an event, blending together story-telling (as you would on a regular blog), curation (pulling product content from other sources: Twitter, Instagram, YouTube, etc.) and interaction (you are notified for example when your tweet is used on Storify).